When prepping for your wedding, it’s always worth remembering that keeping your guests active is essential if you want a memorable event. Bored guests can turn your wedding into a dreary affair that becomes more than evident through the official photography. Here are some solid tips on how to prepare to be an MC for your Wedding: Centering Music Around the Event. The key to preventing this is to learn how to become a good master of ceremonies. If you’re hiring someone for this, they’ll need some proper guidance to assure nothing goes awry. First and foremost, limiting alcohol is top of mind since everyone underestimates what it can do. It’s best for your MC to avoid drinking so they stay sharp in entertaining your guests. However, this is just a start when preparing. An MC also needs to work in tandem with your wedding entertainment to keep things lively. All wedding experts place emphasis on working out a plan for the MC before they host the event. If you’re doing it yourself, work out a basic outline of what you’ll do from beginning to end. Just winging it can lead to numerous awkward moments. Many unexpected situations could occur during the wedding, and you need some prep to know how to handle these scenarios. If you or your MC have good storytelling ability, unexpected emotional or funny moments can turn very memorable. Sit down with your MC and work out what your general theme is, who else might speak, and note what subjects to stay away from. Just like any hosting duty, you need to do a rehearsal. Meet up with your MC a week early at the wedding venue and introduce them to the vendors. You all need to get coordinated so you work out timing when the ceremony takes place. Whether it’s using hand gestures to signal live music, or when bringing another speaker up, work out the procedures so there aren’t any missteps. 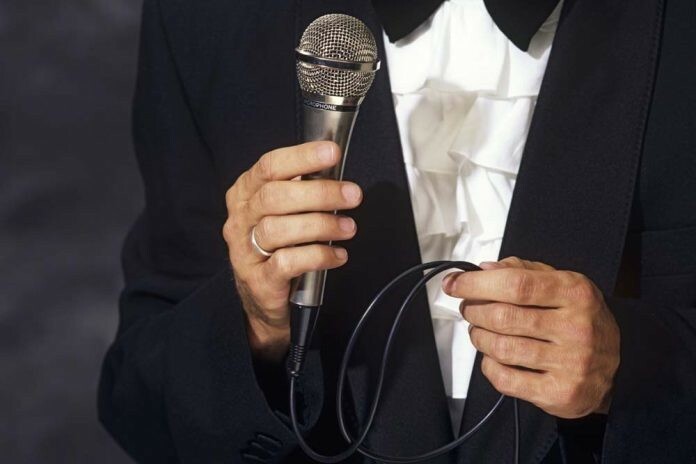 When bringing in a wedding band or wedding singer, they need to work closely with the MC. You’ll need an outline of the music program, including the best times to play before and after the ceremony. Your wedding entertainers require specific cues of when to play songs for weddings rather than be off taking a food break during special moments. Working with your guests is something that’s impossible to test until they arrive. So your MC needs natural ability to interact with people and encouraging them to participate. What’s important is to not only encourage your guests, but also congratulate everyone. This goes beyond just you and your spouse, including congratulating other family members, and friends. Again, working closely with your wedding entertainers needs careful attention here. The MC encourages people to start dancing to the music during your post-ceremony party. Your MC also needs to generate audience enthusiasm for your chosen wedding band or singers. Mediocre MC’s typically think everyone loves hearing them talk. Talking too much can quickly bore guests, including any attempts at being funny. Unless you or your MC have a natural ability at comedy, be sure to test out jokes in advance. Also, avoid lengthy stories that can grind the party atmosphere to a halt. Place more focus on the music and introducing the performers. Since the entertainers are the ones providing most of the entertainment, give them ample time to generate the energy in the venue. Allow your MC to lead off the dancing as well so they entice others to start doing same on the dance floor. Visit us at Lily Road to book quality wedding bands and wedding singers for your upcoming wedding. We’ll make sure the musicians we provide work well with the MC you hire.